Diwali is that time of the year when many Indian families look forward to shopping any bigger stuff as it is considered the propitious period to bring home hot off the press product. A diversified group of car enthusiasts waits for the festive season as they can avail the benefits of tons of discounts, deals, and offers showered by the car manufacturers. Whether to buy a new car or to know about great deals on the existing line up at the dealerships, we are here to ease the process for you. 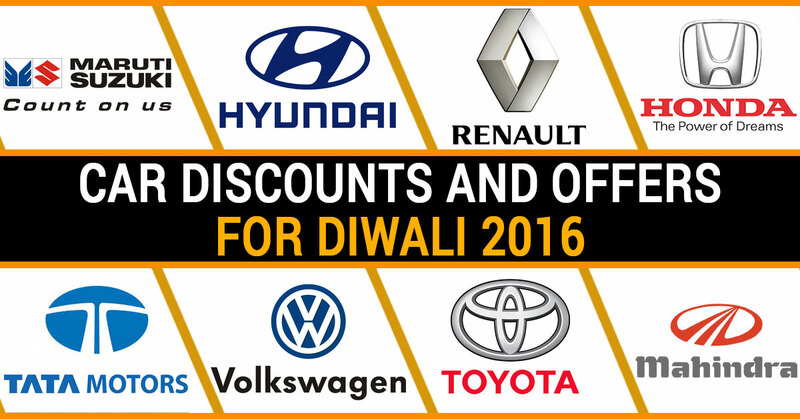 To make you avoid scrounging the web, here’s a list of car discounts and offers for Diwali 2016. Make this festival of light more shimmering by shopping the car you desire. Maruti Suzuki, one of the oldest and popular car manufacturers of the country has been serving the nation as well as global markets since birth. Several generations have witnessed its impressive offerings and being the successful automaker, the brand has always met the expectations of their valuable customers as well in its entire journey, rather, still doing the same. After being quiet for the whole year, Nissan is back on the ground this Diwali. Roaring with a host of discounts and offers, the company is endeavoring to seize the eyes of customers on its existing as well as newbies in the portfolio. The company is gearing up for the upcoming launches- the GT-R and the X-Trail Hybrid. Simultaneously, it is focusing on the discount offers on the Nissan Micra, Sunny, and Terrano. Additional Offer 8.99% Finance from NRFSI (Nissan-Renault Financial Services) + Corporate Discount + Assured Scratch and you may also win gifts including accessories, Laptop TV, DSLR Camera in select dealerships in Mumbai and Delhi. At present, Datsun is having 3 cars for India and making efforts to come up with some extra delights on this Diwali, but, the company will offer a lower rate of interest on its vehicles. Instead of offering great discounts, the company chooses to give an assured gift, one year Insurance and lesser interest rates on finance. However, a couple of showrooms in Delhi and Mumbai are offering exchange bonuses as well. Hyundai has played safe with its compact SUV’s in the whole year as the inward cash flow was tremendous for the brand. Seems like cards of the company are favorable for the festive season as well. The hatchback segment reportedly is growing at a rapid pace in this period and we will certainly get to see huge offers on the Hyundai Eon, Grand i10, i10 and even on the Santa Fe as well. Apart from imparting exchange bonuses up to INR 25,000, Hyundai is also offering insurance for the first year. Unfortunately, the Creta and the recently launched Elantra won’t be blessed with such offers. Renault is the name best suited for compact SUVs, however, the small car segment of the brand is also turning the tables with the new Duster and the new Kwid. The company is offering ‘Aye Dil Hai Mushkil’ offer this festive season in which an ample benefit of more than INR 80,000 will be given on the entire line-up. BMW has introduced a low-interest rate of 7.9 per cent this Diwali, which can be availed by the customers via BMW Financial Services. Whatsoever is the scheme, viz, loan amount, tenure or payment plan, the offer will be valid. With a lesser EMI of up to 40 per cent, this is a deal worth trying. Moreover, the company is also rendering complimentary Service Inclusive Plus and BMW Repair Inclusive for up to 3 years/ 40,000 kilometers for ensuring problem-liberated ownership experience. Apart from this, the company seems like wants to become an apple of one’s eye as it also providing a complimentary one year zero depreciation insurance scheme with an assured buy-back for the vehicle. The offer will end up on 31st October and is available for the BMW 3 Series, the BMW 5 Series, and the BMW X3. One of the assiduous players of the car segment, Honda has never left any single chance to dominate the market with its top-notch offerings. It was and is crystal clear about its position in the Indian car bazaar and for the same reason, we are witnessing cars like the BR-V approaching the new segment with the update of previous facelifts- the Honda Amaze and the Brio in an impressive avatar. To lure its valuable customer base, the company, this festive period, is going out of the box with some exciting discounts and offers. With an extent of up to INR 10,000, the company is providing exchange benefits in several metros that are on the Mobilio for up to INR 2 lakh. What is extremely interesting this Diwali is Honda fest in which a couple of winning couples can win a trip to Norway. All they have to do is to register for the fest. Tata’s recent flagship hatch- Tiago is a blend of style and performance, which is enhancing the sales graph of the company day by day. Besides, the Tata Zest and Bolt are also performing well in their respective segments. Talking about the offers and bonuses, the company is enticing the audience this Diwali with cash bonuses up to INR 50,000 accompanied by impressive exchange offers. Perceiving the success rate of Toyota in the Indian car segment, the company has been tasting victory since the launch of new Innova Crysta, however, the buyers won’t get any discount on the newbie this festive season. Apart from this, customers can avail the benefits from rest of the portfolio for up to INR 50,000. If you think this is it!!! How come we skip mentioning the new Fortuner? Toyota is on the verge of launching the vehicle this November. Now, by this, we can certainly think of ample discounts and offers on the previous version of the SUV. Despite introducing a slew of opulent offerings for the entire year, Audi was highly overwhelmed with applauses by the launch of new A4. In this festive aura, the company has great deals and offers on its entire line-up, which includes the new-generation A4 as well. On a quick brief, there’ll be an exchange bonus of INR 1 lakh on all the cars. The down payment will be of INR 5.99 lakh whereas the interest rate counts for 5.99 per cent with 3 years of extended warranty. Mahindra’s small car segment, which includes the KUV100 as well didn’t witness heavy capitals for the whole year and the automaker remained steady in the beginning. Seems like, it is the festive season for which the carmaker has been waiting so far. Loaded with a bunch of cash discounts and irresistible exchange bonuses, Mahindra is turning up the heat among the car enthusiasts of the country. Specifying the popular players of the company- the Figo Aspire and the Endeavour didn’t create much charm this year and resultantly, it’s been a hectic period for the company. But somehow, Ford has managed to cover up the sales numbers up to a good extent. As the festival of lights is approaching near, the company has announced several benefits to lighten up the customers. Offering an auto finance at 8.4 per cent interest rate, Ford is going to delight the customers with 100 per cent On-Road Finance offer. The much-popular Figo Aspire will be available with free insurance for the first year along with INR 25,000 exchange bonus and INR 18,000 exchange bonus on others.